OpenOffice.org is a powerful productivity suite–including tools for word processing, spreadsheets, slideshows and more—with one major additional feature: it’s free. Whether OpenOffice 3—the first version to run natively on OS X and Intel-based Macs—is right for you essentially comes down to this decision: can you live without the latest features in Microsoft Office 2008? Most of the tools you need for productivity are here, minus an e-mail client. There’s Writer, a powerful word processor; Calc for spreadsheets; Impress for slideshows; Draw for basic drawing and graphics; and Base to serve as—you guessed it—a database. OpenOffice 3 is a major upgrade over the previous version, with plenty of new features, native OS support, and all the tools most people would need to get their work done. You begin in a splash screen called the Start Center, with new icons for the different applications you can select (you can’t start the individual apps from the Applications folder). You can share data between apps, and run more than one module at the same time. As a native OS X suite, OpenOffice 3 is extremely fast. The Writer application zips along without any of the annoying pauses and hiccups of the previous X11 Unix version (which you’ll still need if you own a PowerPC-based Mac). I tested OpenOffice 3 on a MacBook Pro Core 2 Duo 2.4GHz with 2GB of RAM; the application formatted a 200-page novel at lightning speed—like I was using TextEdit. Calc, the spreadsheet program, also ran fast. OpenOffice.org—which is a collaborative effort from developers who donate their time—does not post the minimum processing speed to run the apps; however, on a single-core 1.5GHz Intel Mac Mini with only 512MB of RAM, OpenOffice 3 was sluggish and crashed a few times. The suite requires at least 512MB of RAM and an Intel processor, with 400MB of space available on your hard drive. If you don’t need all the bells and whistles of Microsoft Office, check out OpenOffice.org 3, a free productivity suite that has many of Office’s capabilities. There’s another major change in the latest version of the software: OpenOffice 3 supports the OpenDocument 2.1 (ODF) standard, a popular format that’s used around the world, especially by government agencies. Speaking of format support: Writer supports Microsoft Word files, so you can open them and then save them in Word format or as ODF. However, if you want to save a document in Word format, you must continually choose “Save as,” because the program does not natively support Word. In fact, the Save menu is dimmed when you open a Word file. This forces you to make a decision about whether you should start using ODF, a format that is still not supported by Microsoft Word ( ). So what has changed in each app? For starters, Writer now supports editing notes that run along the side of the screen—something like Word’s comment bubbles. These can be formatted with a different color for each editor, which facilitates group editing of documents; but it’s a far cry from the extensive comment bubbles, markup, and reviewing pane options in Word 2008, which allow you to track all changes, see the original document and various other views, and highlight changes. Writer has a new zoom slider on the status bar and a way to view multiple pages on the screen at once. If you’re a former Office user switching to OpenOffice 3, you may be annoyed to find that you can’t hover your mouse over the status bar to see what the features will do—and there’s no pop-up help system. However, there is extensive documentation and loyal users willing to provide forum support. Calc now includes a Solver wizard that helps you optimize the calculations within cells on a spreadsheet. It works okay, but it’s no deal-closer—no one buys a spreadsheet program for a calculation solver. OpenOffice 3 enhances the chart functionality in Calc, supporting regression equations and correlation coefficients. Most importantly, a pie chart I made in Calc—from my home budget spreadsheet, which includes 24 workbooks, thousands of calculations, and extensive data sets—rendered quickly on a MacBook Pro. I also like the new workbook-sharing feature: you can click an option to share your data, a co-worker can make changes, and then you can integrate those changes back into the original document. This feature, which is available in Excel ( ), was sorely lacking in previous versions of OpenOffice. Calc also supports up to 1,024 columns in a spreadsheet as opposed to only 256 in the previous version. Impress, the slideshow program, can now perform a few extra tricks. You can import a table from Calc and edit it directly—it’s no longer just a static image. My favorite addition, though, is multi-monitor support. I hooked up my MacBook Pro to a projector and ran slides on one screen and my outline on another. It’s slick, and with native OS X support, it also ran fast and nimbly. Draw has only a few enhancements, including a way to crop images by just grabbing handles and moving them. Unfortunately, even with these new features, there’s still a lot missing compared to Office 2008. Most critical: the latest Microsoft suite uses elements for documents, charts, tables, and other sections of your document that allow you to quickly format your pages. They are amazingly helpful—a bit like templates, but for individual sections of your document. 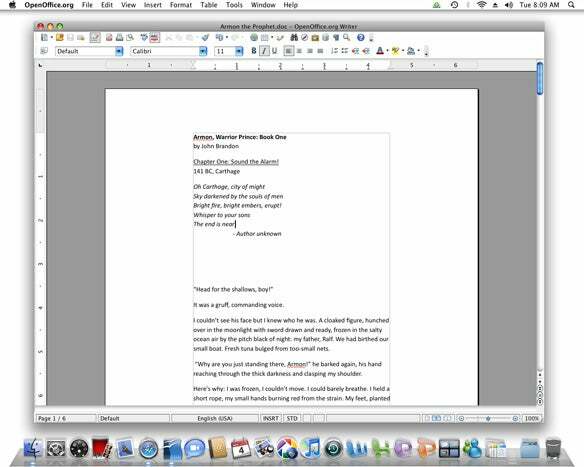 When using OpenOffice 3, I also really missed Microsoft Office’s snazzy notebook view, noteflags, annotated audio clips you can export to an iPod, multi-page printing, enhanced auto correction features, and advanced document security. OpenOffice.org also doesn’t provide any e-mail or calendaring apps, which is not a major gripe—there are plenty of open source options available. The decision here is not whether OpenOffice.org 3 is worth the download—the program is free—but whether you really need to buy Microsoft Office 2008. Ultimately, Office 2008 is the superior product. You’ll get extensive call-in support, few crashes, and the latest and most advanced features. On the other hand, OpenOffice 3 is one of those 80-20 products. It will do what 80 percent of what most of people need it to do, and the latest version now does it natively on OS X. It’s speedy, feature-rich, and does what it says it will do very well. And if that’s all you really need (and if you can live without the latest Office features), it’s definitely worth the effort.